Aloha! Researchers at the University of Hawaii at Manoa say that the Leeward side of Hawaiian Islands may be ideal for future ocean-based renewable energy plants that would use seawater from the oceans' depths to drive massive heat engines and produce steady amounts of renewable energy. Researchers at the University of Hawaii at Manoa say that the Leeward side of Hawaiian Islands may be ideal for future ocean-based renewable energy plants that would use seawater from the oceans' depths to drive massive heat engines and produce steady amounts of renewable energy. The technology, referred to as Ocean Thermal Energy Conversion (OTEC), is described in the Journal of Renewable and Sustainable Energy, which is published by the American Institute of Physics (AIP). It involves placing a heat engine between warm water collected at the ocean's surface and cold water pumped from the deep ocean. Like a ball rolling downhill, heat flows from the warm reservoir to the cool one. The greater the temperature difference, the stronger the flow of heat that can be used to do useful work such as spinning a turbine and generating electricity. The history of OTEC dates back more than a half century. However, the technology has never taken off -- largely because of the relatively low cost of oil and other fossil fuels. But if there are any places on Earth where large OTEC facilities would be most cost competitive, it is where the ocean temperature differentials are the greatest. 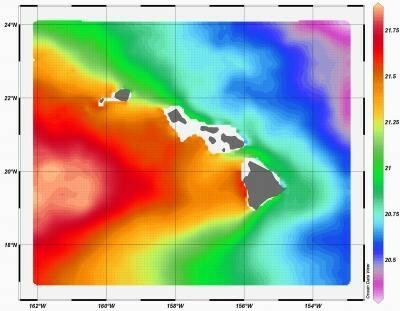 Analyzing data from the National Oceanic and Atmospheric Administration's National Oceanographic Data Center, the University of Hawaii's Gérard Nihous says that the warm-cold temperature differential is about one degree Celsius greater on the leeward (western) side of the Hawaiian Islands than that on the windward (eastern) side. This small difference translates to 15 percent more power for an OTEC plant, says Nihous, whose theoretical work focuses on driving down cost and increasing efficiency of future facilities, the biggest hurdles to bringing the technology to the mainstream. "Testing that was done in the 1980s clearly demonstrates the feasibility of this technology," he says. "Now it's just a matter of paying for it."